This Cardholder Agreement ("Agreement") sets forth the terms and conditions under which the RushCard Prepaid Visa Card ("Card") has been issued to you by MetaBank®. "You" and "your" means the person or persons who have received and are authorized to use the Card as provided for in this Agreement. "We," "us," and "our" mean collectively, MetaBank, a federally-chartered savings bank, member FDIC, and its divisions or assignees, and also includes, unless otherwise indicated, our Program Manager. "Program Manager" refers to Green Dot Corporation, who performs certain services related to your Card on MetaBank’s behalf. The Card is nontransferable, and it may be canceled at any time without prior notice, subject to applicable law. Please read this Agreement carefully and keep it for future reference. Your full fee schedule, otherwise known as the "Long Form," is attached to and considered part of this Agreement. Your Card is a prepaid card, which allows you to access funds loaded to your Card account. You should treat your Card with the same care as you would treat cash. We encourage you to sign your Card when you receive it. This Card is intended for personal, family, or household use and not intended for business purposes. Your Card account does not constitute a checking or savings account and is not connected in any way to any other account you may have. The Card is not a gift card, nor is it intended to be used for gifting purposes. The Card is not a credit card. You will not receive any interest on the funds in your Card account. We may close your Card or refuse to process, suspend, or delay any transaction that we believe may violate the terms of this Agreement or represents illegal or fraudulent activity. You are responsible for notifying us immediately upon any change to your address, phone number, or email address. If your address changes to a non-U.S. address, we may cancel your Card and return funds to you in accordance with this Agreement. Important information for opening a Card account: To help the federal government fight the funding of terrorism and money laundering activities, federal law requires all financial institutions to obtain, verify, and record information that identifies each person who opens an account. What this means for you: When you request a Card, we will ask for your name, street address, date of birth, Social Security Number, and other information that will allow us to identify you. We may also ask to see a copy of your driver’s license or other identifying documents at any time. You may be limited in use and features until we have been able to successfully verify your identity. Eligibility and Activation: Without limiting the other terms and conditions of this Agreement, to be eligible to use and activate the Card, you represent and warrant to us that: (i) you are at least 18 years of age or are at least 13 years of age and have your parent’s or guardian’s consent to obtain a Card; (ii) you are a U.S. citizen or lawfully residing in the 50 states of the U.S. or the District of Columbia (collectively, the "U.S."), excluding Vermont; (iii) you have provided us with a verifiable U.S. street address (not a P.O. Box); (iv) the personal information that you have provided to us is true, correct, and complete; and (v) you have read this Agreement and agree to be bound by and comply with its terms. If you believe your Card has been lost, stolen, or used without your permission, call or write Customer Service IMMEDIATELY at the contact information found at the beginning of this Agreement. Tell us AT ONCE if you believe your Card has been lost or stolen, or if you believe that an electronic fund transfer has been made without your permission. Calling Customer Service is the best way of keeping your possible losses down. You could lose all the money in your Card account. If you tell us within 2 business days after you learn of the loss or theft of your Card, you can lose no more than $50 if someone used your Card without your permission. If you do NOT tell us within 2 business days after you learn of the loss or theft of your Card, and we can prove we could have stopped someone from using your Card without your permission if you had told us, you could lose as much as $500. Also, if your electronic history shows transfers that you did not make, including those made by your Card or other means, tell us at once. If you do not tell us within 60 days after the earlier of the date you electronically accessed your Card account (if the unauthorized transfer could be viewed in your electronic history) or the date we sent the FIRST written history on which the unauthorized transfer appeared, you may not get back any money you lost after the 60 days if we can prove that we could have stopped someone from taking the money if you had told us in time. If a good reason (such as a long trip or a hospital stay) kept you from telling us, we will extend the time periods. Under Visa’s Zero Liability Policy, your liability for unauthorized transactions on your Card is $0.00 if you notify us promptly upon becoming aware of the loss, theft, or unauthorized use and you were not negligent or fraudulent in the handling of your Card. This policy limiting your liability does not apply to debit transactions not processed by Visa, certain commercial card transactions, or unregistered cards. For purposes of this Agreement, our business days are Monday through Friday, excluding Federal holidays. Customer Service hours may differ. Each time you use your Card, you authorize us to reduce the value available on your Card by the amount of the transaction and applicable fees. If you use your Card number without presenting your Card (such as for an internet transaction or a mail order or telephone purchase), the legal effect will be the same as if you used the Card itself. Subject to the limits identified in subsection b. below, you may use your Card to purchase or lease goods or services wherever your Card is honored as long as you do not exceed the value available in your Card account. pay eligible bills directly from your Card account. Loading the Card account: You may add funds to your Card, called "loading," by: (i) Automated Clearing House ("ACH") loads (e.g., direct deposit); (ii) loading cash through one of our reload locations (a list is available at https://www.rushcard.com/fund-account); (iii) cashing an eligible check and transferring those funds to your Card via a third-party mobile check load provider, subject to the terms and conditions established by such third-party provider from time to time; and (iv) receiving funds from another Card via our Card-to-Card transfer service, which allows cardholders to authorize the transfer of funds from their Card accounts to other Card accounts by providing instructions via the Card program website. See the Limits table below for limitations on amount and frequency for different load methods. Each load may be subject to a fee as set out in the Long Form. If you arrange to have funds transferred directly to your Card from a third party through an ACH load, you must enroll with the third party by providing the bank routing number and direct deposit account number that we provide you. The only federal payments that may be loaded to your Card via ACH credit are federal payments for the benefit of the primary cardholder. If you have questions about this requirement, please call Customer Service. We will reject any loads that exceed the maximum balance allowed on your Card. There are also maximum load restrictions we may place on your Card when aggregated with any other Cards you have. You agree to present your Card and meet identification requirements to complete load transactions as may be required from time to time. Split Transactions: If you do not have enough funds available in your Card account for a transaction, you may be able to instruct the merchant to charge a part of the purchase to the Card and pay the remaining amount with another form of payment. These are called "split transactions." Some merchants do not allow cardholders to split transactions or will only allow you to do a split transaction if you pay the remaining amount in cash. Maximum amount of ATM withdrawals $3,000 per calendar month. Maximum amount of teller cash withdrawals $3,000 per calendar month. ** The maximum combined amount that can be withdrawn or spent from your Card account per day is $5,000. In addition to the foregoing limits, to prevent fraud and maintain the security of your Card account, additional limits apply to the use of your Card for transactions outside the U.S., including at Internet and mail or telephone order merchants and ATMs located outside the U.S. For fraud and security reasons, we may also impose additional limits, at any time and without notice, on the amount, number, and type of transactions you can perform with your Card and on any funding or load of your Card. Subject to the limits identified in subsection b. above, if you obtain your funds (or make a purchase) in a currency or country other than the currency or country in which your Card was issued ("Foreign Transaction"), the amount deducted from your funds will be converted by the network or card association that processes the transaction into an amount in the currency of your Card. The rate they choose is either: (i) selected from the range of rates available in wholesale currency markets (which may vary from the rate the association itself receives), or (ii) the government-mandated rate in effect for the applicable central processing date. The conversion rate selected by the network is independent of any fee that we charge as compensation for our services. You will be charged a fee for Foreign Transactions in U.S. dollars as disclosed in the Long Form. If the Foreign Transaction results in a credit due to a return, we may not refund any fee that may have been charged on your original purchase. You may not permit another person to have access to your Card or Card number. If you do provide access to your Card or Card number, you are liable for all transactions incurred with the Card or Card number, even if they exceed the authorization granted. Your Card is for use by you. You may not request an additional Card for another person. We do not offer companion or secondary cardholder Cards. You may not attempt to load your Card with direct deposits designated to another person and no one but you may load funds to the Card. You may be able to get a receipt at the time you make any transfer to or from your Card account using an ATM or point-of-sale terminals. You may need a receipt in order to verify a transaction with us or the merchant. You may obtain information about your Card balance by calling Customer Service. This information, along with a 12–month history of account transactions, is also available online at the website mentioned above. You also have the right to obtain at least 24 months of written history of account transactions by calling or by writing Customer Service. You will not be charged a fee for this information unless you request it more than once per month. You do not have the right to stop payment on any purchase transaction originated by use of your Card, except as expressly provided herein. If you have told us in advance to make regular payments out of your Card account, you can stop any of these payments. Call or write to Customer Service with the contact information located at the beginning of this Agreement in time for us to receive your request three business days or more before the payment is scheduled to be made. If we do not receive your request at least three business days before the scheduled payment date, we may attempt, in our sole discretion, to stop the payment. However, we assume no responsibility for our failure or refusal to do so, even if we accept your stop payment request. If you call, we may also require you to put your request in writing and get it to us within 14 days after you call. If we do not receive the written request within 14 days after you call, we may honor subsequent payments with your Card account. Unless you tell us that all future payments to a specific recipient are to be stopped, we may treat your stop-payment order as a request concerning one specific payment only. If these regular payments vary in amount, the person you are paying should tell you, at least 10 days before each payment, when it will be made and how much it will be. Please note that the person you are going to pay may give you the option of receiving notice only when the payment would differ by more than a certain amount from the previous payment or when the amount would fall outside certain limits that you set. If you order us to stop one of these regular payments three business days or more before the transfer is scheduled, and we do not do so, we will be liable for your losses or damages to the extent provided in this Agreement or required by law. For any other exception stated in this Agreement. Except as provided in the Long Form, when you use an ATM not owned by us, you may be charged a fee by the ATM operator (and you may be charged a fee for a balance inquiry even if you do not complete a fund transfer). If you have arranged to have direct deposits made to your Card account at least once every 60 days from the same person or company, the person or company making the deposit should tell you every time they send us the money. You can call Customer Service to find out whether or not the deposit has been made. We reserve the right to reject or limit transfers to your Card account via direct deposit in our sole discretion and may reject, suspend, or delay any direct deposit that has identifying information that does not match the identifying information (such as name and Social Security Number) that we have on file for your Card account. With certain types of purchases (such as those made at restaurants, hotels, or similar purchases), your Card may be "preauthorized" for an amount greater than the transaction amount to cover gratuity or incidental expenses. Any preauthorization amount will place a "hold" on your available funds until the merchant sends us the final payment amount of your purchase. Once the final payment amount is received, the preauthorization amount on hold will be removed. During this time, you will not have access to preauthorized amounts. If you authorize a transaction and then fail to make a purchase of that item as planned, the approval may result in a hold for that amount of funds. If you tell us orally, we may require that you send us your complaint or question in writing within 10 business days. We will determine whether an error occurred within 10 business days after we hear from you and will correct any error promptly. If we need more time, however, we may take up to 45 days to investigate your complaint or question. If we decide to do this, we will provisionally credit your Card account within 10 business days for the amount you think is in error, so that you will have the money during the time it takes us to complete our investigation. If we ask you to put your complaint or question in writing and we do not receive it within 10 business days, we may not provisionally credit your Card account. For errors involving new Card accounts or point-of-sale or foreign-initiated transactions, we may take up to 90 days to investigate your complaint or question. For new Card accounts, we may take up to 20 business days to provisionally credit your Card account for the amount you think is in error. We will tell you the results within three business days after completing our investigation. If we decide that there was no error, we will send you a written explanation. You may ask for copies of the documents that we used in our investigation. If you need more information about our error-resolution procedures, call Customer Service or visit our website. When you activate your Card, you must select a PIN to be assigned to your Card. If you load funds onto your Card without setting a PIN, you will not be able to access the funds until you set your PIN. You should not write or keep your PIN with your Card. Never share your PIN with anyone and do not enter your PIN into any terminal that appears to be modified or suspicious. If you believe that anyone has gained unauthorized access to your PIN, you should contact Customer Service immediately. If you are entitled to a refund for any reason for goods or services obtained with your Card, the return and refund will be handled by the merchant. If the merchant credits your Card, the credit may not be immediately available. While merchant refunds post as soon as they are received, please note that we have no control over when a merchant sends a credit transaction and the refund may not be available for a number of days after the date the refund transaction occurs. We are not responsible for the quality, safety, legality, or any other aspect of any goods or services you purchase with your Card. If you need to replace your Card for any reason, please contact Customer Service. See the Long Form for applicable fees. Please note that your Card has a "Valid Thru" date on the front of the Card. You may not use the Card after the "Valid Thru" date on the front of your Card. However, even if the "Valid Thru" date has passed, the available funds on your Card do not expire. You will not be charged a fee for replacement cards that we send due to expiration of the Card. If you allow another person to use the Card, you will be responsible under this Agreement for all transactions made by that person, regardless of whether you intended to be responsible for all of them, as well as all associated fees and charges, even if any of those transactions, fees, or charges caused your balance to go negative. You agree that we may monitor and record any calls or other communications between us and you. You also agree that we and our service providers may contact you with any contact information you provide to us, including cellular and wireless phone numbers, landline numbers, and email addresses. You also agree that we and our service providers may contact you by using an automated dialing or email system, by text, or artificial or recorded voice. You agree to pay any service charges assessed by your plan provider for communications we send or make to you and that you send or make to us. You may close your Card account at any time by contacting Customer Service. Your request for Card closure will not affect any of our rights or your obligations arising under this Agreement prior to the request. Should your Card account be closed, we will issue you a credit for any unpaid balances, subject to fees as disclosed in the Long Form. We reserve the right to close your Card account should you complete or attempt to complete any of the prohibited actions in this Agreement. You may not assign or transfer your Card or your obligations under this Agreement. We may, however, transfer or assign our rights under this Agreement, including any balances in your Card account. If we assign our rights, you will get a notification from us. Regardless of where or how we are served, we will comply with any state or federal legal process, including, without limitation, any writ of attachment, adverse claim, execution, garnishment, tax levy, restraining order, subpoena, or warrant we believe to be valid relating to you or your Card. You agree that we will honor legal process that is served personally, by mail, or by facsimile transmission at any of our offices (including locations other than where the funds, records, or property sought is held), even if the law requires personal delivery at the office where your Card account records are maintained. You agree that we will have no liability to you for honoring any such legal process. You also agree that we will have no obligation to assert on your behalf any applicable exemptions to execution or attachment under any applicable state or federal law. We will enforce a right of security interest against any of your Card accounts in order to reimburse us for our fees and expenses, including attorneys’ fees, court costs, and expenses, in complying with legal process. We may refuse to permit withdrawals or transfers from your Card account until such legal process is satisfied or dismissed, even if such action results in insufficient funds to satisfy an obligation you may have incurred. We may deduct such expenses from your Card account or any other account you may have with us without prior notice to you, or we may bill you directly for such expenses and fees. You agree to release and indemnify, defend, and hold us harmless from all actions, claims, liabilities, losses, costs, and damages, including, without limitation, attorneys’ fees, associated with our compliance with any legal process. When we receive an order instructing us to restrict access to funds in a Card account, we may remove the funds from the Card account and maintain them separately. You will be notified of any change to this Agreement in the manner required by applicable law prior to the effective date of the change. However, if the change is made for security purposes, we can implement such change without prior notice. We do not waive our rights by delaying or failing to exercise them at any time (for example, assessing a fee less than described, or not all, for any reason does not waive our right to begin charging the fee as set forth in this Agreement without notice). If any provision of this Agreement is determined to be invalid or unenforceable under any rule, law, or regulation of any governmental agency, local, state, or federal, the validity or enforceability of any other provision of this Agreement will not be affected. This Agreement will be governed by the law of the state of South Dakota, except to the extent governed by federal law. Should your Card have a remaining balance after a certain period of inactivity, we may be required to remit the remaining funds to the appropriate state agency. What is arbitration? An alternative to court In arbitration, a third-party arbitrator ("Arbitrator") solves Disputes in an informal hearing. Is it different from court and jury trials? Yes The hearing is private. There is no jury. It is usually less formal, faster, and less expensive than a lawsuit. Pre-hearing fact finding is limited. Appeals are limited. Courts rarely overturn arbitration awards. Can you opt-out of this Arbitration Clause? Yes, within 60 days If you do not want this Arbitration Clause to apply, you must send us a signed notice within 60 calendar days after you receive this Agreement. You must send the notice in writing (and not electronically) to our Notice Address. Provide your name, address, and Card number. State that you "opt out" of the Arbitration Clause. What is this Arbitration Clause about? The parties' agreement to arbitrate Disputes Unless prohibited by applicable law and unless you opt out, you and we agree that you or we may elect to arbitrate or require arbitration of any "Dispute" as defined below. Who does the Arbitration Clause cover? You, us and certain "Related Parties" This Arbitration Clause governs you and us. It also covers certain "Related Parties": (1) our parents, subsidiaries and affiliates; (2) our employees, directors, officers, shareholders, members, and representatives; and (3) any person or company that is involved in a Dispute you pursue at the same time you pursue a related Dispute with us. What Disputes does the Arbitration Clause cover? All Disputes (except certain Disputes about this Arbitration Clause) This Arbitration Clause governs all "Disputes" that would usually be decided in court and are between us (or any Related Party) and you. In this Arbitration Clause, the word "Disputes" has the broadest reasonable meaning. It includes all claims even indirectly related to your Card or this Agreement. It includes claims related to the validity in general of this Agreement. However, it does not include disputes about the validity, coverage, or scope of this Arbitration Clause or any part of this Arbitration Clause. (This includes a Dispute about the rule against class arbitration.) All such disputes are for a court and not an Arbitrator to decide. The American Arbitration Association ("AAA"), 120 Broadway, Floor 21, New York, NY 10271, www.adr.org. Can you or another consumer start a class arbitration? No The Arbitrator is not allowed to handle any Dispute on a class or representative basis. All Disputes subject to this Arbitration Clause must be decided in an individual arbitration or an individual small-claims action. This Arbitration Clause will be void if a court rules that the Arbitrator can decide a Dispute on a class basis and the court's ruling is not reversed on appeal. What law applies? The Federal Arbitration Act ("FAA") This Agreement and the Cards involve interstate commerce. Thus, the FAA governs this Arbitration Clause. The Arbitrator must apply substantive law consistent with the FAA. The Arbitrator must honor statutes of limitation and privilege rights. Punitive damages are governed by the constitutional standards that apply in judicial proceedings. Will anything I do make this Arbitration Clause ineffective? No This Arbitration Clause stays in force even if: (1) you or we end this Agreement; or (2) we transfer or assign our rights under this Agreement. What must a party do before starting a lawsuit or arbitration? Send a written Dispute notice and work to resolve the Dispute Before starting a lawsuit or arbitration, the complaining party must give the other party written notice of the Dispute. The notice must explain in reasonable detail the nature of the Dispute and any supporting facts. If you are the complaining party, you must send the notice in writing (and not electronically) to our Notice Address. You or an attorney you have personally hired must sign the notice and must provide the Card number and a phone number where you (or your attorney) can be reached. A letter from us to you will serve as our written notice of a Dispute. Once a Dispute notice is sent, the complaining party must give the other party a reasonable opportunity over the next 30 days to resolve the Dispute on an individual basis. How does an arbitration start? Mailing a notice If the parties do not reach an agreement to resolve the Dispute within 30 days after notice of the Dispute is received, the complaining party may commence a lawsuit or an arbitration, subject to the terms of this Arbitration Clause. To start an arbitration, the complaining party picks the administrator and follows the administrator's rules. If one party begins or threatens a lawsuit, the other party can demand arbitration. This demand can be made in court papers. It can be made if a party begins a lawsuit on an individual basis and then tries to pursue a class action. Once an arbitration demand is made, no lawsuit can be brought and any existing lawsuit must stop. When will we cover your legal fees and costs? If you win If you win an arbitration, we will pay the reasonable fees and costs for your attorneys, experts and witnesses. We will also pay these amounts if required under applicable law or the administrator's rules or if payment is required to enforce this Arbitration Clause. The Arbitrator shall not limit his or her award of these amounts because your Dispute is for a small amount. Will you ever owe us for arbitration or attorneys' fees? Only for bad faith The Arbitrator can require you to pay our fees if (and only if): (1) the Arbitrator finds that you have acted in bad faith (as measured by the standards set forth in Federal Rule of Civil Procedure 11(b)); and (2) this power does not make this Arbitration Clause invalid. 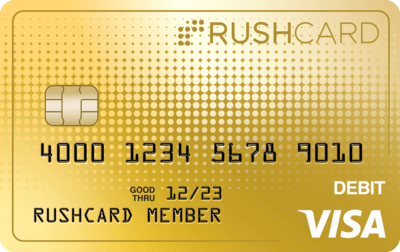 RushCard Prepaid Visa card is issued by MetaBank, Member FDIC, pursuant to a license from Visa U.S.A. Inc. PLEASE READ CAREFULLY BEFORE USING OR ACCESSING THIS WEBSITE. BY ACCESSING THIS WEBSITE YOU ARE INDICATING YOUR ACKNOWLEDGMENT AND ACCEPTANCE OF THESE TERMS. Trademarks, service marks, and logos appearing on a Site are the property of UniRush or the party that provided the trademarks, service marks, and logos to UniRush, whether registered or not. UniRush and any party that provided trademarks, service marks, and logos to UniRush retain all rights with respect to any of their respective trademarks, service marks, and logos appearing on a Site. Notice and Procedure for Making Claims of Copyright Infringement. Pursuant to Title 17, United States Code, Section 512(c)(2), notifications of claimed copyright infringement should be sent to our Designated Agent. If you believe that your copyrighted work is being infringed on a Site, please notify our copyright agent specified below. Identification of the copyrighted work claimed to have been infringed, or, if multiple copyrighted works at a single Site are covered by a single notification, a representative list of such works at that Site. Identification of the material that is claimed to be infringing or to be the subject of infringing activity and that is to be removed or access to which is to be disabled, and information reasonably sufficient to permit UniRush to locate the material. Information reasonably sufficient to permit UniRush to contact the complaining party, such as an address, telephone number, and, if available, an electronic mail address at which the complaining party may be contacted. Nothing on a Site shall be construed as conferring any license under any intellectual property right, including any right in the nature of trademark or copyright, of UniRush or any third party, whether by estoppel, implication, or otherwise. Downloading software from this website does not give you title to such software, including any files, data and images incorporated in or associated with the software. Your use of any such software shall be only in accordance with the license agreement that is included with the software or presented upon download of such software. Software may not be copied, redistributed or placed on any server for further distribution. You may not sell, modify, decompile, disassemble, or otherwise reverse engineer the software. A description to a product, service or publication on this website (including any description or reference via hyperlink) does not imply endorsement by UniRush of that product, service or publication. Products and software offered through this website shall be warranted, if at all, through the written license or warranty provided in connection with such product or software. Use the website for commercial purposes, or post messages that contain advertising or are intended to solicit others to buy or sell services or to make donations. UniRush is not obligated to monitor the communications contained on the website. However, UniRush may, at its sole discretion edit, decline to post, or remove any information or materials or any portion thereof. You hereby grant to UniRush the royalty-free, perpetual, irrevocable, worldwide, non-exclusive right and license to use, reproduce, modify, adapt, publish, translate, create derivative works from, distribute, perform, and display all content, remarks, suggestions, ideas, graphics, or other information communicated to UniRush through this website (collectively, the "Submission"), and to incorporate any Submission in other works in any form, media, or technology now known or later developed. UniRush will not be required to treat any Submission as confidential, and may use any Submission in its business (including without limitation, for products or advertising) without incurring any liability for royalties or any other consideration of any kind, and will not incur any liability as a result of any similarities that may appear in future UniRush operations. We make no representations or warranties that our website is free of defects, viruses or other harmful components. The pages on our website may contain technical inaccuracies, outdated information and typographical errors. We shall not be responsible for any damages or loss that may result from the hacking or infiltration of this website or our computer systems. If you are dissatisfied with any portion of this website or the associated services, your sole remedy is to cease using them. ACCESS TO THIS WEBSITE IS PROVIDED FREE OF CHARGE AS A COURTESY. HOWEVER, ALL MATERIALS, INFORMATION, SOFTWARE PRODUCTS, AND SERVICES INCLUDED IN OR AVAILABLE THROUGH THIS WEBSITE ARE PROVIDED "AS IS" AND "AS AVAILABLE." UNIRUSH DISCLAIMS ALL WARRANTIES OF ANY KIND, EXPRESS OR IMPLIED, INCLUDING WITHOUT LIMITATION IMPLIED WARRANTIES OF MERCHANTABILITY, FITNESS FOR A PARTICULAR PURPOSE, AND NONINFRINGEMENT. UNIRUSH MAKES NO WARRANTIES OR REPRESENTATIONS CONCERNING THE SUITABILITY, RELIABILITY, AVAILABILITY, TIMELINESS, OR ACCURACY OF THE INFORMATION, PRODUCTS OR SERVICES CONTAINED IN OR OBTAINED THROUGH THIS WEBSITE FOR ANY PURPOSE. SOME JURISDICTIONS DO NOT PERMIT THE EXCLUSION OF CERTAIN WARRANTIES; THESE EXCLUSIONS MAY NOT APPLY TO YOU. UNDER NO CIRCUMSTANCES SHALL UNIRUSH OR ITS SUBSIDIARIES, AFFILIATES, LICENSORS, SERVICE PROVIDERS, CONTENT PROVIDERS, EMPLOYEES, AGENTS, OFFICERS, AND DIRECTORS BE LIABLE FOR ANY DIRECT, INDIRECT, PUNITIVE, INCIDENTAL, SPECIAL, CONSEQUENTIAL, OR ANY OTHER DAMAGES WHATSOEVER THAT MAY RESULT FROM THE USE OF OR THE INABILITY TO USE THIS WEBSITE, INCLUDING WITHOUT LIMITATION, DAMAGES ARISING FROM MISTAKES, OMISSIONS, INTERRUPTIONS, DETERIORATION OR CORRUPTION OF FILES, DELETION OR CORRUPTION OF EMAIL, ERRORS, LOSS OF DATA, LOSS OF PROFITS, DEFECTS, VIRUSES, AND/OR DELAYS. THIS LIMITATION APPLIES WHETHER THE ALLEGED LIABILITY IS BASED ON CONTRACT, TORT, NEGLIGENCE, STRICT LIABILITY OR OTHERWISE, EVEN IF UNIRUSH HAS BEEN ADVISED OF THE POSSIBILITY OF SUCH DAMAGES. YOU HAVE THE SOLE RESPONSIBILITY FOR ADEQUATE PROTECTION AND BACKUP OF DATA AND/OR EQUIPMENT USED IN CONNECTION WITH THIS WEBSITE. SOME JURISDICTIONS DO NOT PERMIT THE EXCLUSION OR LIMITATION OF LIABILITY FOR CONSEQUENTIAL OR INCIDENTAL DAMAGES; UNIRUSH’S LIABILITY IN SUCH JURISDICTIONS SHALL BE LIMITED TO THE EXTENT PERMITTED BY LAW. This website and the information contained or referred to herein does not constitute an offer or a solicitation of an offer for the purchase or sale of any securities. This website may contain information and press releases about and by UniRush. While information prepared by us was believed to be accurate as of the date so prepared, we disclaim any duty or obligation to update such information or to verify the accuracy of information prepared by others. Any statements in this website that are not historical facts, including but not limited to plans, projections, objectives, goals, strategies, future events or performance and underlying assumptions, are forward-looking statements as provided in the rules and regulations of the Securities Act of 1933, Securities Exchange Act of 1934, and the Private Securities Litigation Reform Act of 1995. Such statements are intended to fit within the ‘safe harbor’ for forward-looking information and are subject to material risk factors which may or may not be disclosed herein. Statements or phrases that use such words as "believes," "anticipates," "plans," "may," "hopes," "can," "will," "expects," "estimates," "predicts," "is designed to," "with the intent," "potential," and similar expressions commonly indicate forward-looking statements, but in their absence do not mean that a statement is not forward-looking. Any forward-looking statements contained herein involve risks and uncertainties, including but not limited to general economic and currency conditions, various conditions specific to UniRush’s business and industry, market demand, competitive factors, supply constraints, technology factors, government and regulatory actions, UniRush’s accounting policies, future trends, and other risks which are detailed in UniRush’s Securities and Exchange Commission filings. UniRush reserves all legal rights and remedies available to it and this disclaimer shall in no way be deemed a limitation or waiver of any other rights UniRush may have. All rights not expressly granted herein are reserved exclusively and entirely to UniRush.